Mill Valley Jr. Football & Cheer Association has been formed at the request of Mill Valley Head Football Coach Joel Applebee. It is his belief, and those involved, that we are creating an atmosphere at Mill Valley that others will strive to equal. In an effort to organize our youth teams, and their development in the Mill Valley system, and be better prepared for high school, we are asking youth players and coaches to consider Coach Applebee’s request. 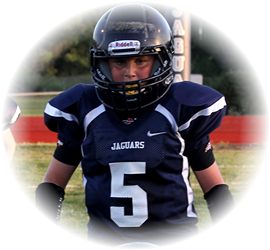 By participating in MVJFCA, your player will be given everything they need to be a success in the Mill Valley system, and continue the Jaguar tradition as they become a high school player. Please remember that everything MVJFCA does is an effort to help kids succeed at both the youth and high school level.